Gearboxes, do I need one and which type is best for my application? Time and time again we are asked to explain the differences between gearbox types and why gearboxes are needed. 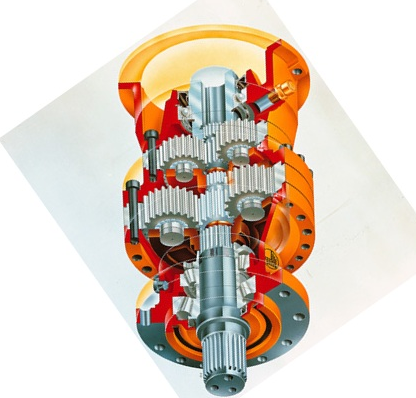 In the simplest term, a gearbox is basically a way or increasing or decreasing motor speed, torque and even direction. What Gear motor is suitable for you depends on your particular application, each gearbox type has its own advantages and disadvantages. Below we describe some of the common Gear motors available and give you list of their strengths and weaknesses. In general terms AC motors have outputs of around about 1250-1500 rpm (4 pole or up to 3200 RPM 2 pole) , where as DC motors will give an output of anywhere between 15 rpm to 30,000rpm depending on the type of motor it is. While this speed can be useful, often there's no practical use to make use of the high speed and low torque without some form of reduction to make the torque greater and the rpm lower, that's where the gearbox is useful. A gearbox turns that high speed and low torque into lower speed and higher torque via a term labelled "Mechanical Advantage". You can consider a gearbox to be a small box of levers. The further the leverage point is from the source, the greater amount of torque can be transmitted with the force you apply. Overall that's a pretty simplified way or looking at things, but gives you a pretty good feel for how a gearbox works. Have you ever noticed the tools that are made for tightening the biggest nuts have the longest handles? The most common type of gearbox is a standard spur gear configuration. These are the simplest gearbox to make and so is the most common and cheapest to manufacture. Spur gears are straight cut gears intermeshed together to form the gearbox. 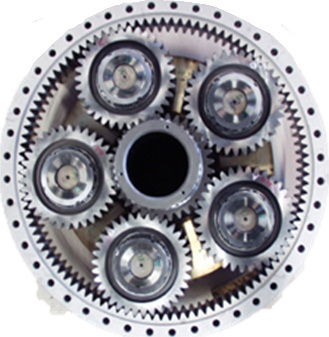 They have straight teeth that mesh with other spur gears to reduce speed and increase torque or increase speed and decrease torque or change rotational direction. Generally it takes many spur gears to make large reductions and space is always a limiting factor when designing these. While spur gears and common and cheap to buy, they aren't always the best solution, especially where high torque or speed is required. They can be quite noisy to operate and the stress on the gears can be destructive if too much force is applied. 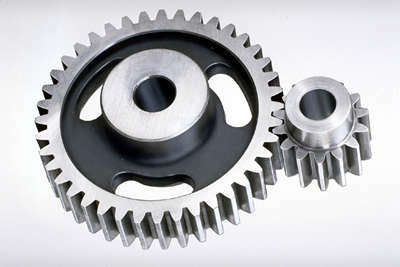 Below, picture of a Spur gear set. If you were to drive the large spur gear, the smaller one would revolve much faster meaning that there would be a torque reduction and a speed increase on the other spur gear. If you ran the smaller spur gear there would be less speed transferring to the bigger spur gear but the torque would be greater. 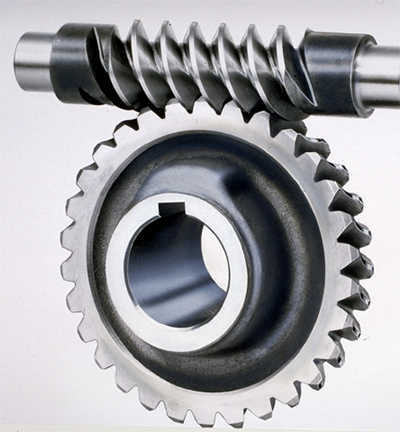 Helical gears are the next evolutionary step from Spur Gears. The teeth are cut at an angle to the leading edge of the gear meaning rather than the need to engage as the spur gear does, the gears mesh together over the length of the helical cut. This enables for a much smoother transfer of torque and less of a noise generation than spur gears can make at similar speeds. We also have available a cheaper DC range which is the V.T.V DC motor range, from 15w to 90w with gearboxes. Worm gears are used where braking or excessively large gear reductions and torque are required. The worm drive has advantages of massive torque generation and low noise because of the high ratios they generally run. One advantage that worm drives have over traditional gearboxes is that the worm can turn the gear, but the gear cannot turn the worm, thus creating a brake (although don't bank on this!). The down side of worm drives is efficiency. 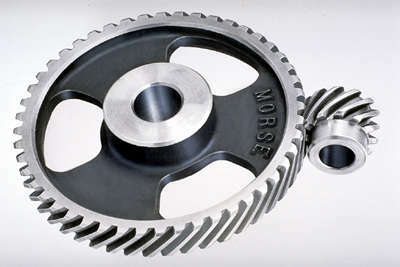 Average efficiency of a worm drive is around 65% which means a high power loss. Is the load is great enough, the worm can actually creep! We have available a few types of worm drives for general use. Click here to be taken to the worm drive page! Also known as epicyclical gearboxes is a gearbox that consists of 1-6 outer spur gears that rotate around a central gear (also known as the sun gear) and the planet carrier (the outer gear). These are more complex gearboxes but can provide great torque transmission, high efficiency and low noise. Generally most handheld drills utilise planetary gearboxes simply for their strength and efficiency. Click here to see our planetary gearmotors, we also have planetary gearmotors for use in Electric Bikes or Scooters!